For Nick Nacca image making isn’t capturing a moment in time, its several moments combined. He’s a super control freak. Not just on set. Later, in a dim room he builds an image from the ground up. Blending, shaping, sculpting with light is at the heart of his process that creates images that stand out in a world of clutter. It’s not just a different approach to lighting; it’s a different way of seeing. 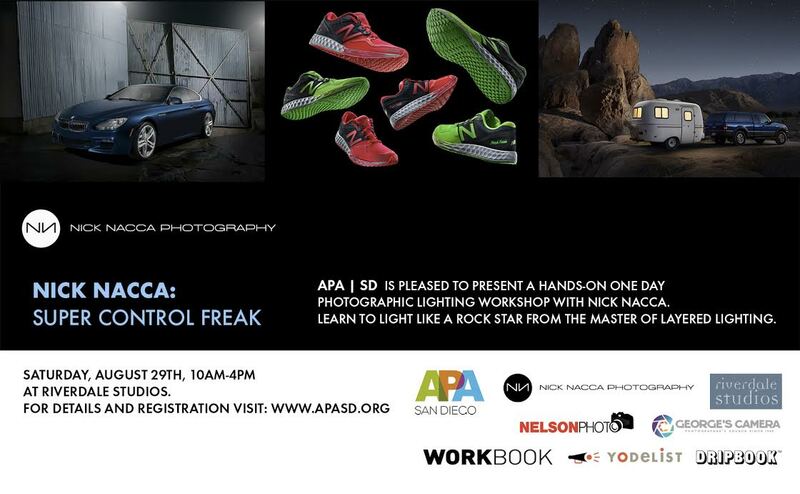 Join Nick & APA/SD for a hands on workshop where together we will photograph a vehicle then integrate models into the scene for a seamless composite. Working images from the shoot will be made available to the attendees to create their own versions of the image. go to support the San Diego chapter of American Photographic Artists.